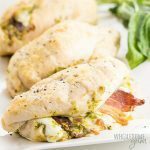 This easy recipe makes the juiciest pesto stuffed chicken breast with bacon, mozzarella and sun-dried tomatoes. It's the best way to make baked pesto chicken! Thank you to Zwilling J.A. Henckels for providing the knives featured in this post. All opinions are my own. Happy Valentine’s Day, everyone! We’re enjoying dinner out tonight, but I still thought it was a perfect day to share this baked pesto stuffed chicken breast with bacon recipe. 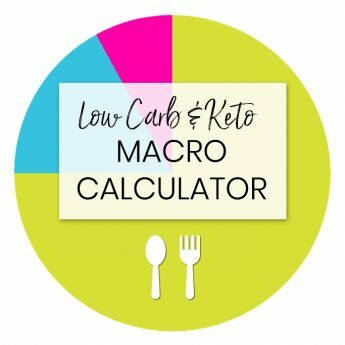 It’s super easy, yet appropriate for a romantic low carb dinner! I remembered this baked pesto chicken this week when I was desperate for a quick freezer meal. Ever since we returned from our California trip (which was awesome! ), things have been a little crazy. We came home to two sick kids (boo!) and a million things we are behind on. I have had virtually no time to cook anything. 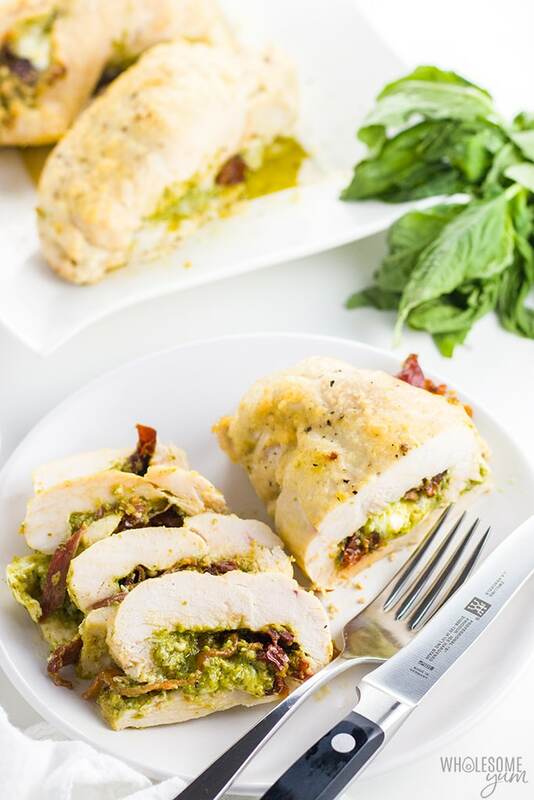 It’s a good thing my freezer was stocked with some of this baked pesto stuffed chicken breast with bacon. I had frozen it uncooked and was able to place it straight into the oven. Baked stuffed chicken breast is one of those dishes that looks impressive, making you think you don’t have time for it on busy nights. But, the reality is that it’s super simple! It’s even faster if you stock some in your freezer. 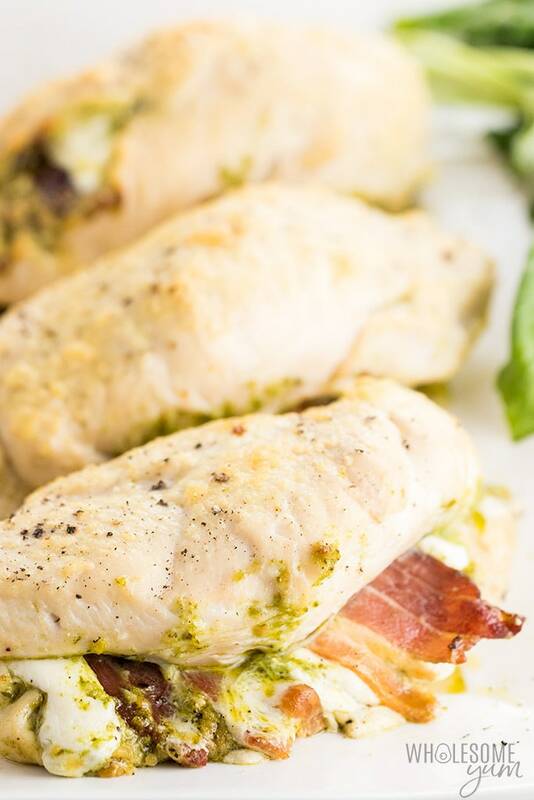 And, it doesn’t get any better than baked pesto chicken breast stuffed with mozzarella and bacon. Well, actually it does – if you add sun-dried tomatoes, and a sprinkle of parmesan on top. Yum! I’ve been making this pesto chicken recipe for years, but was inspired to make it again a couple months ago, when I received a new knife block from Zwilling J.A. Henckels. We ended up going out when I made the chicken, though, so into the freezer it went. More on the knives later, but for now, let me just say that I’m absolutely in love with them. It has been fun to see how easily they cut through things that can be challenging for most other knives. 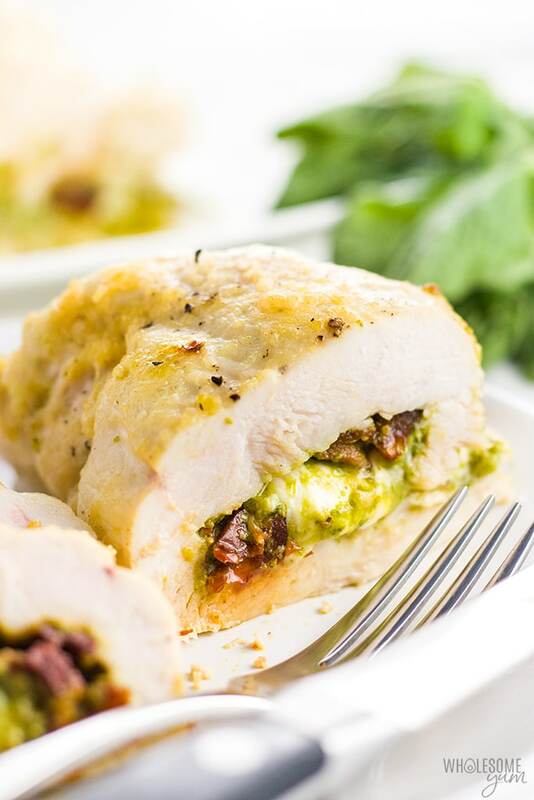 Bacon and pesto stuffed chicken breast is a good example! It’s not easy for me to call this the best baked pesto chicken recipe. For several reasons. First of all, I’m a huge fan of baked stuffed chicken in general. It really ups your game on boring ol’ chicken. And, it’s a lot easier for it to stay juicy and not dry out. If you’re looking for other ways to prepare stuffed chicken, I have some other healthy, easy stuffed chicken recipes. Try this cream cheese spinach stuffed chicken breast, or the first variation I posted on the blog, with spinach and tomatoes. Then there’s the pesto sauce. Who doesn’t love pesto? Can’t go wrong with baked pesto chicken. Fortunately, pesto is one of those things you can actually buy without weird ingredients. But, if you have just a few minutes to make homemade macadamia nut pesto, it’s out-of-this-world good! Some of my favorite ways to use pesto include Caprese salad skewers and pesto salmon Milano. This Italian flavor goes with so many things. It’s hard to choose just one favorite dish with pesto, but this pesto stuffed chicken breast recipe just might be at the top of my list. The combination of basil pesto sauce, fresh mozzarella, sun-dried tomatoes, and bacon = just perfection. In fact, all the ingredients for this baked stuffed chicken breast are very simple. You might just have them at home. If not, you can find them at any grocery store without trying to hunt down something unusual. And the taste? Oh my goodness, you guys. So incredibly flavorful. Like a mouthful of all the best Italian flavors combined. And delicious with a side of green beans. I always get raving compliments every time I serve this. Even from people that aren’t on board with my low carb way of eating. Yay for that! When it comes to baking stuffed chicken breast with bacon, there are two main ways to do it. There’s bacon wrapped chicken breast, and there’s this version where the bacon is inside. You might have seen bacon wrapped stuffed chicken breast a little more frequently. And I’ll be the first to say, I adore chicken wrapped in bacon. But, I also love chicken coated in Parmesan cheese. For this pesto stuffed chicken breast recipe, I decided to go with a Parmesan coating on the outside. It adds a slight effect reminiscent of breading, but less heavy. Plus, this way you get the flavor combination of the pesto, mozzarella, sun-dried tomatoes and bacon all being right next to each other, in the center of the chicken. Finally, the reason I chose to cook the bacon separately is I could cook it for longer in the pan to get it crispy. In comparison, it gets a little less crisp when it cooks in the oven wrapped around chicken. All that being said, bacon wrapped chicken is awesome, too! If you’d rather have bacon wrapped stuffed chicken breast instead of placing the bacon inside, you can. You can actually use raw bacon if you do it that way. Regardless of what you are stuffing the chicken with, the process is the same. And, it’s super easy! Like my base baked chicken recipe, I always start by brining the chicken. Simply let it sit in salt water for at least ten minutes. Why do this? Because it makes the chicken extremely juicy! In the case of baked stuffed chicken breast with bacon, you can pan fry the bacon while that’s happening. It takes the same duration, about ten minutes, so you don’t really waste any time. Pat the chicken dry, and butterfly each chicken breast. What does that mean? Just cut into the chicken horizontally, not quite going all the way through, so that you are able to “open” it (like butterfly wings) and lay flat. Next is the fun part. Pound it as thin as you can, using the flat side of a meat tenderizer! I think this is fun, or at least relieves stress. Whoever or whatever you are mad at that day, let it all out! Season both sides with salt and pepper, then add your fillings and roll up tightly. For pesto stuffed chicken breast with bacon, the fillings included pesto, sun-dried tomatoes, bacon, and fresh mozzarella. Tuck in the sides as you roll and place onto a baking sheet. You can use toothpicks to secure the stuffed chicken breast if you want to, but you don’t have to. I usually just place it seam side down and it stays together just fine. The key is to pound it thin and roll it tightly. For baked stuffed chicken breast in general, you can stick it in the oven at this point. But, for my pesto chicken recipe, I also brush with egg and sprinkle with Parmesan cheese first. Now, how long to bake stuffed chicken breast? How long do you bake stuffed chicken breast? That depends on the thickness of your chicken and the oven temperature. How long to bake stuffed chicken at 350 degrees will be very different from the time needed at 450. 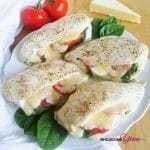 There are different preferences for the right temperature to make baked stuffed chicken breast. I prefer high temperature, mainly because I’m impatient and always running behind on everything. So, I like to save time in the oven. Like most of my chicken recipes, this one bakes at 450 degrees for 15-18 minutes. You want it to be cooked through, of course, but still juicy. In my oven, 16 minutes is perfect. If you want to be sure, you can use a meat probe. Just stick it in the thickest part of the pesto stuffed chicken, set the desired temperature, and it will beep when it’s ready. I usually set the temperature to a little lower than fully cooked, because the meat will actually continue to cook from residual heat as it rests for a few minutes after removing from the oven. I’ve been looking for some high-quality knives for my kitchen for quite some time, so I was super excited to get the set from Zwilling J.A. Henckels. When I used them to cut through this baked stuffed chicken breast, I noticed a big difference over my old set. No effort at all – like butter! Besides, my Professional S knife set has been quite the conversation starter with guests ever since I got it. Everyone is always impressed by the ergonomic design, razor sharp blades, and overall quality. If a larger set is out of budget, you could try getting just the basics. There are just two knives that are a must for the kitchen – a chef’s knife and a paring knife. Fortunately, the chef’s knife and paring knife come in a 2-piece set here, which is a great price for them. Or, just get a set of four steak knives, like the ones I have pictured in the photos. 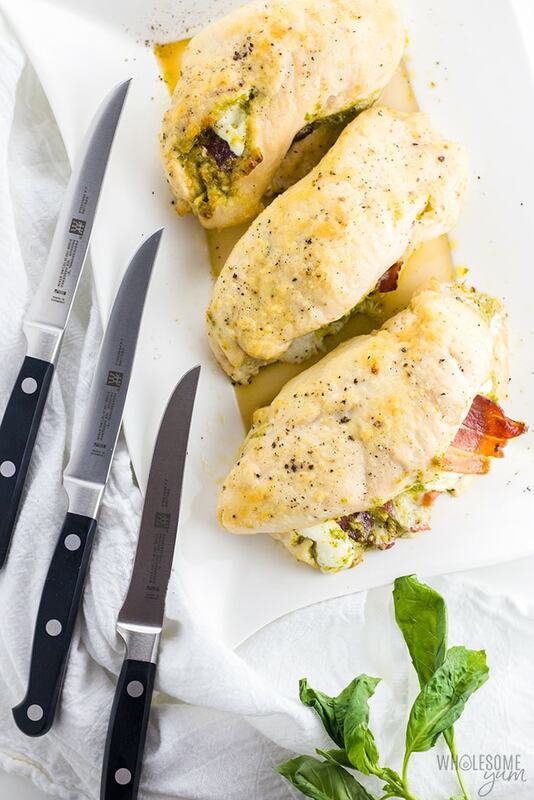 Aside from the knives, what is the best way to serve pesto stuffed chicken breast with bacon? Truly, it will be the star of your meal, and many things pair wonderfully with it. I usually serve it with a big salad or one of my favorite low carb side dishes. Preheat the oven to 450 degrees F (232 degrees C). Line a baking sheet with parchment paper. Fill a large bowl with warm water. Add a couple tablespoons sea salt and stir until dissolved. Add the chicken breasts to the bowl. Set aside to brine for 10 minutes. Meanwhile, cook the bacon. Place strips in a single layer on a cold pan. Turn on the heat to medium. Fry without moving until the bacon releases easily, then flip and fry on the other side. Total time is about 10 minutes. Remove the chicken from the water and pat dry. Butterfly the chicken breasts and pound until very thin (about 1/4 in (1/2 cm) thick). Season both sides with sea salt and black pepper. Spread basil pesto in a thin layer over each piece of chicken (about 1 1/2 tbsp (21 g) on each), leaving a 1/2 in (1.3 cm) border. Arrange sun-dried tomatoes and thinly sliced fresh mozzarella over the pesto. Place a slice of bacon in the center. Roll up each piece of chicken, such that the bacon also gets rolled up. (In other words, roll perpendicular to the bacon slice, not parallel.) Tuck in the edges as you roll. Place seam side down onto the lined baking sheet. Whisk the egg in a small bowl. Brush the egg over the top of each piece of chicken in a very thin layer. Sprinkle with Parmesan cheese. How would you cook these in a toaster oven? That is all I have at work. Hi Cindy, Sorry, I’ve never tried cooking chicken in a toaster oven. You could also cook it at home and reheat it if in doubt. 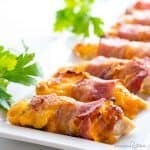 For the pesto bacon stuffed chicken recipe- if this is a make ahead recipe during pregnancy how do you reheat it? Do you freeze it raw or cook it first? And either way how long to cook if frozen? Hi Terri, You can reheat it in the oven. I recommend freezing it raw, then just thaw overnight in the fridge and bake the next day. I made this last night and my wife said it was the best chicken she ever had. She said we should keep having it even when I’m not doing keto. I can’t think of a better compliment than that. Thanks so much for the recipe. It’s delicious! If I want to prepare this for the freezer uncooked as you did, what are the steps? Am I cooking the bacon completely or partially since it will cook in the oven etc I’m going to make this next week and if my family likes it I want to make it a meal that’s prepped and ready to go. Hi Paula, Cook the bacon completely before rolling it inside the chicken. Once the chicken is rolled up with the fillings, you can freeze it raw, and bake from frozen. Tried this recipe, but I think I rolled it wrong. Is there a video? Hi Kelly, I haven’t made a video for this one yet – it’s on my list. In the meantime, roll parallel to the bacon. Let me know if there’s a specific issue you had with the rolling and I can try to help! I hope you liked the chicken otherwise. 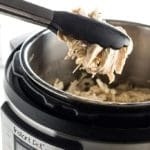 I don’t know how to print recipes from this website. I push the print button and then can’t find any place to actually print. Hi Holly, The Print button will take you to a printer-friendly page. From there you’d print the same way as any other website. If you are on a PC, the Ctrl+P keyboard shortcut will print, or Command+P on a Mac. This sounds so delicious. I will be trying it this weekend. Your pictures are amazing and I’m so glad I found this recipe! Thank you for creating this!